I truly appreciate Akash's teachers enthusiasm..Every festival has a new craft item ready which can be taken home..children enjoy making it and teachers enjoy working with them. 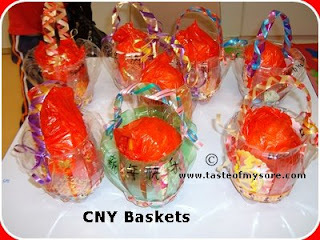 Here comes two varieties of Chinese New Year (CNY) baskets in which they gave orange and few other goodies for children to take away. They are very easy to make take a look.. They have cut the Tissue paper box into two. 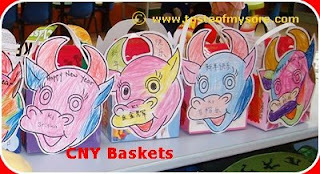 The front side has the colored picture (colored by children) of OX which is the animal of the year. The other sides of the box is decorated with colored paper and glitter! The next type of baskets are from used up pepsi/coke/ 1.5 litre bottles. Just stare at it to know the piece of art created by children! They all go to Shama's Kid's Freindly Art event. Happy hosting Shama.. 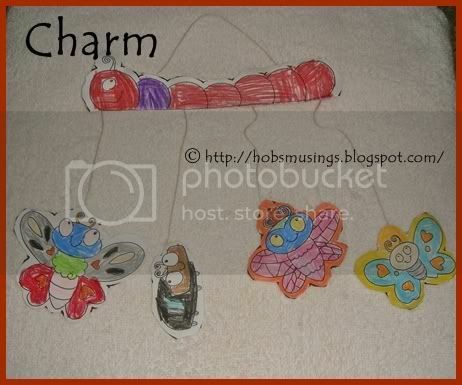 This is Akash's contribution to Shama's Kid's Friendly Craft Event. Shama is trying to keep her 2yr occupied. I am sure it is challenge to all mom's to keep their younger ones occupied. Akash merrily brought back this paper charm from his craft class for this event. The picture explains itself so I am not writing down the procedure to make this simple charm.